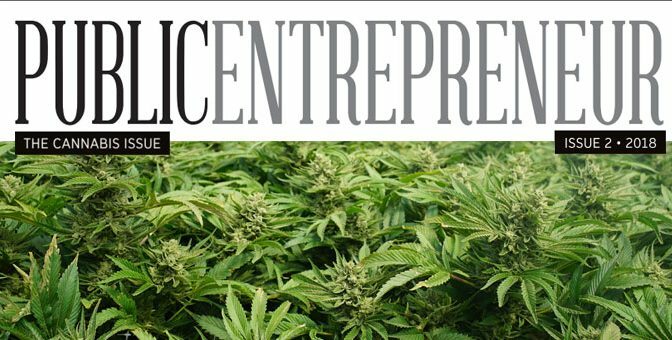 With legalization of marijuana a hot topic heading into the summer of 2018, the newest issue of the CSE’s flagship publication, Public Entrepreneur, focuses on the highly dynamic cannabis industry. This edition of the magazine features interviews with a diverse range of cannabis entrepreneurs, a reflection of just how far the industry has come in the span of about five years. From stories about firms cultivating cannabis to the variety of delivery systems to the expansion into consumer products such as beverages and more, this issue provides interesting perspectives on the cannabis industry from the folks working to bring ideas to market. In addition, this issue also features an in-depth interview with four women cannabis influencers who share their perspectives about being a woman in this fast-moving space and where they see opportunities to change perspectives, both about marijuana as well as what defines an entrepreneur and business leader in the cannabis industry. Click below to view the latest issue. Spacefy (CSE:SPFY) CEO Russ Patterson recently sat down with Barrington Miller to explain how Spacefy is building the “Airbnb” for creative spaces (3:15), the weirdest booking he’s seen (so far) on their platform (11:00), and ambitions for expansion into global, world-class cities (15:30). Listen until the end to hear about Russ’ favourite creative space and his idea of the ultimate location in Toronto.